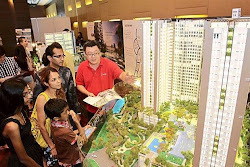 Ideal Property’s condominium in Sungai Ara, Penang — Imperial Residences — will provide residents with three acres of recreational space. The condo’s Sunshine Zone is a collection of outdoor facilities including a 50m-long swimming pool, Jacuzzi, island cabana, sun and pool decks, indoor and outdoor gymnasiums with a yoga room and a multi-function games court. Children are in for watery fun at the Kids’ Adventure Cove, which will have an ‘Adventure Cabin’, playground, water slide deck and a pool with a beach, bubble zone, wading and splashing areas. Residents will find a quiet corner at Repose Bay and its gourmet cabin with a grill, teppanyaki and BBQ pavilion. It also has a gardener’s cabin, a reflexology path and a family seating area. The green side of the condo’s recreational area is named Enchanted Nature. Residents will find a garden pavilion, meditation pods within an exotic garden, a fitness and wellness corner and a jogging track. For those in need of a moment’s contemplation, Imperial Residences will have Tranquil Bay with its Evolvulus Court (named after a bright blue species of morning glory flowers), a leisure lounge with water fountains and a viewing lawn. At the Outdoor Leisure Bay, a bicycle trail awaits. “Imperial Residences will be built with recreational facilities that are at par with luxurious resorts,” said Ideal Property’s sales and marketing manager Teh Yeow Jin. The condo, he said, would comprise three towers with 816 units. The built-up area of each unit is between 1,100sq ft and 1,200sq ft and prices start from RM450 per sq ft. There are also a limited number of exclusive garden houses at each tower. Teh added that the condo was expected to be completed by 2017. Yet another hot new condominium in Ideal Property’s list of offerings is Solaria Residences in Bayan Lepas. Located along Jalan Tun Dr Awang, Solaria Residences is near the One Residence and Penang International Airport and surrounded by almost every amenity for conducive living with schools, hypermarket, shopping malls, hospitals, banks and fancy eateries just minutes away. “Solaria is perfect for families. It is exclusive yet conveniently close to town,” Teh said, adding that the 25-storey building would have 399 residential units and also retail outlets on the street floor. The developer is also putting the varied needs of homeowners in the forefront by offering five unit layouts and also semi-detached types. The completion date of Solaria is expected to be within 36 months from the sales and purchase agreement. Ideal Property will also launch i-Santorini next year. This condominium in Jalan Desiran and Jalan Seri Tanjung Pinang 1 will feature unparalleled resort-living standards. “It will be built on 9.27 acres of leasehold land, which is expiring in 2100,” Teh said, adding that i-Santorini would be launched in the first quarter of 2015.